The Toronto Argonauts may be doing a little pre-spring cleaning after announcing they had released quarterbacks Kerry Joseph, Cody Pickett and LB Zeke Moreno on Sunday. 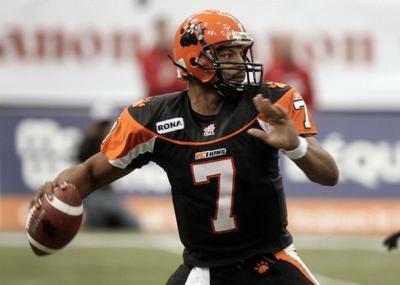 Generally teams don’t release their two best QB’s unless they have a plan in place, and according to Sportsnet’s Arash Madani on Twitter, they may just be finalizing the fine print on such a plan, and it may involve the BC Lions. Madani suggested today that the Argos and Lions are working on a deal that would see Jarious Jackson heading to the Argos. He also suggested that the Lions might be close to signing LB Barrin Simpson, and both DE Riall Johnson (Montreal) and Teyo Johnson (Calgary). Madani’s fellow columnist Perry Lefko seems to back up the speculation in this article today. While the dealing of Jackson makes sense in the fact that the Lions will have to cut lose a QB to re-sign Casey Printers to a starter’s contract, it is surprising it’s Jackson and not Buck Pierce being dangled if that’s the case. While Pierce is younger and perhaps a more complete QB when healthy, the problem lies in the fact he can’t stay off the injured list. Jackson is coming off a rotator cuff injury, while Pierce has had both shoulder and concussion issues. Both are good coming off the bench in games, so you would think the Lions would take less risk by unloading Pierce. It’s been less than a month since David Braley purchased the Toronto Argonauts, and the fact he may be bringing a quarterback from his other club will be looked at closely by several parties. BC fans will be wanting to make sure the Lions receive decent compensation in return for a quality QB. Argos fans will be watching to see what the Lions get in return, and teams looking for QB’s will be watching to see if the Argos got their new starting QB for fair market value. At the time that Braley bought the Argos, both he and the league said all the right things about maintaining the integrity of the game. I believe them both when they say that, but it doesn’t mean all the parties involved won’t be looking at any deals between the two clubs. Stay tuned!